Is there still value in developing an IT strategic plan? 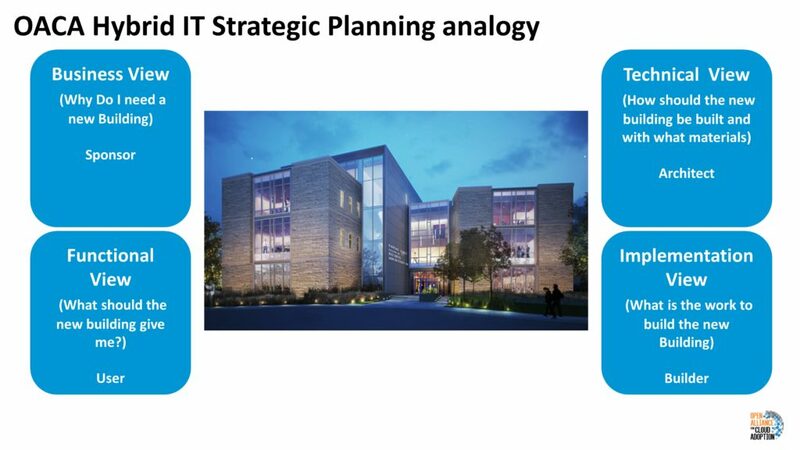 As a Technologist Strategist, I was asked for help to develop an IT Plan to transform a company’s IT operational model. At that time the concept of an IT strategy was not a common practice. After six weeks of work that involved most of the over 200 people in their IT organization, the plan was developed. The plan guided their IT transformation from 1992 to 1996 and transformed their IT operating model. Since that time I have worked with about 50 companies and governments to help them develop their IT strategy. Most of these IT transformation plans were based on a 3-year implementation window. Today this approach to IT Strategic planning is not as relevant because it is now possible to consume cloud services and adopt new IT capability in a matter of hours. It is now possible to deploy applications five times a day and promote them directly to production. Furthermore, most enterprises are facing the fact that to stay competitive it is necessary to adopt these new development methodologies and IT operating model practices very fast to survive. 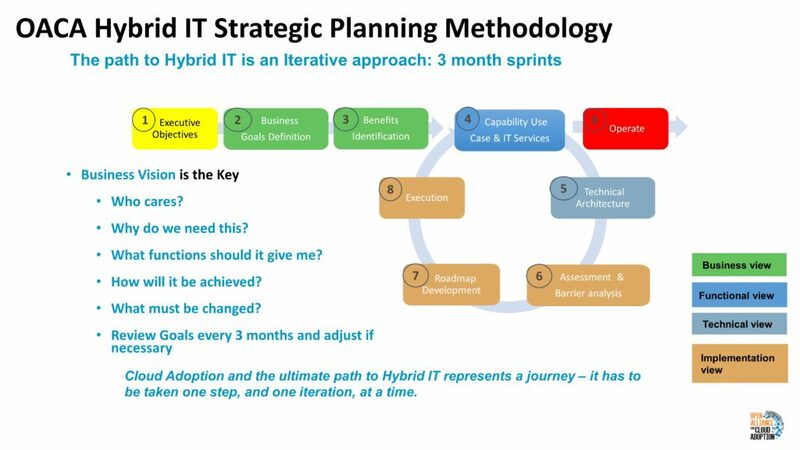 Does a three year IT transformation plan fit into today’s IT operating model challenges? The fact is it doesn’t. However, moving to a model that is just driven by technology also doesn’t work. I am concerned with the overemphasis of companies needing to “move to the cloud” or “digitize.” The goal should not be to digitize. The goal should be to deliver better value to an enterprise by using new technology wisely and to provide services as efficiently as possible. To do this well a new approach to IT Strategic planning is necessary. We at the OACA have developed an approach that utilizes many of the disciplines of traditional IT Strategic Planning. We have married it with the techniques used in agile software development methodology and published this approach in the Cloud Maturity Model Version 4.0 document. In this blog I will provide you with a short overview of this new approach. A Strategic plan needs to consider all technologies available to an enterprise. When the Cloud solutions began to become widely accepted around 2011 many businesses saw it as an easy solution to their IT problems. However many found out that some cloud solutions were a lot like the song ” Hotel California”. It was easy to check in but you could never leave. Also many started to realize that not all workloads are suitable for a cloud approach and running them in their own data centers was a better solution. Furthermore, with the increase of Internet of Things solutions a Hybrid IT operating model has become the best approach for the delivery of IT solutions for many enterprises. Each of these points of view provides a perspective on the new IT environment that needs to be created to support the enterprise going forward. The Business View defines what are the business demands that need to be addressed. The Functional view defines the functions or use cases that need to be delivered. The Implementation view defines the resources necessary to implement the technical and functional views. It also identifies the changes needed to the current IT operating model to support new technologies and it defines the implementation timeframe. To address the rapidly changing business demands that technology is putting on companies, we recommend that the implementation plan is defined in three-month sprints. This concept was drawn from agile software development theory and applied to IT strategic planning. This approach focuses on implementing quickly new solutions and also reviewing all projects every three months to ensure that they are still needed. Initially, we chose six-month iterations, but we have now dropped it to three-month iterations to align better with the quarterly performance of a company. We also recommend that an enterprise review their business goals and the supporting functional IT requirements quarterly. Businesses are changing quickly, and without carefully reexamining goals and projects quarterly it is possible to continue working on projects that are no longer necessary or worse miss new opportunities that require IT projects to support them. All military strategic planners look for potential problems that will become barriers to accomplishing their battle plan. 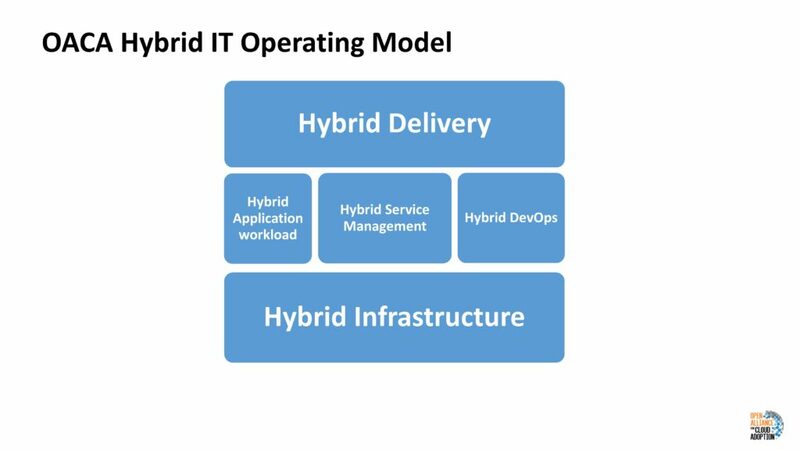 The same discipline needs to be implemented in Hybrid IT Strategic Plans. The most common potential problem occurs when IT does not align with the business and functional views that the new technical architecture must support. I spoke with one Cloud Provider that focused on the technical view only and used a “build it, and they will come” approach, and unfortunately, no customers came. The services that they created did not reflect what their customers wanted, and as a result, the customers went elsewhere. This can happen to any IT department that develops a Hybrid IT implementation architecture without clearly understanding the needs of their business. Another potential problem area occurs when insufficient analysis of the impact of the new technology architecture on the current IT operating model is not conducted. To address this need the OACA Cloud Maturity Model was developed to help companies to be able to conduct an in-depth analysis of their process people and technology, to identify where changes are required. The IT Strategic Plan needs to include projects to address the transformation of the IT Operating model as well as the new business functions. So to come back to my original question, is there still value in developing an IT strategic plan? 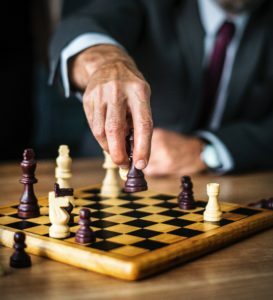 A strategy is a military term, that means “a science or art of combining and employing the means of war in planning and directing large military movements and operations”[i] Many businesses are in a war, and survival will depend on how well they plan. I believe that there has never been as urgent a time, for an enterprise to take an aggressive approach to planning the use of new technology. I read recently that the average life of a corporation is about 14 ½ years. I also discovered that the primary reason businesses are failing is their inability to adapt to rapidly changing business models. These new business models are often driven by technology. There are great new opportunities that await those who embrace the latest technologies. New businesses like Uber have sprung up because and embraced the opportunities that new technologies enabled them to do, and as a result, they have quickly taken significant market share. The key to accomplishing this is a solid IT Strategy. 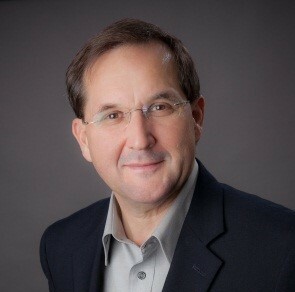 Bill is the Digital Strategist for Liam Associates Inc. Formerly the Cloud Chief Technologist for Hewlett-Packard Enterprise Canada, Bill has provided IT Strategic Planning advisory and planning services to over fifty Private and Public sector clients to help them migrate to a Hybrid IT Operating model. These transformation plans have helped both government and industry reduce the cost of IT, re-engineer their IT governance models, and reduce the overall complexity of IT. Bill is also a member of the Open Alliance for Cloud Adoption Team and has co-authored several documents on Cloud Maturity and Hybrid IT implementation.